This entry was posted in Facts & Statistics, News & Views and tagged anti-war left, Black people, criminalizing, current administration, drugs, enemies, impeachment, indictments, John Ehrilchman, lies, Nixon, Trump's lies, vilification on January 5, 2019 by Ray Buchanan. In yesterday’s post I wrote that charging Trump with treason seemed to be warranted. 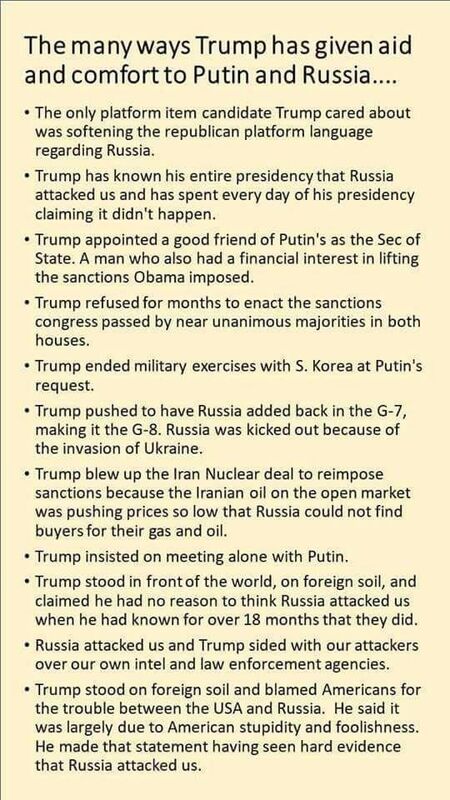 Here is a short list of the many ways this piece of filth has offered aid and comfort to Russia. This entry was posted in Facts & Statistics, News & Views and tagged aid & comfort, coverup, enemies, financial interest, G-7, invasion, Iran Nuclear Deal, lying, Obama, Putin, Russia, sanctions, secret meetings, siding with our enemies, treason, Trump, Ukraine on August 21, 2018 by Ray Buchanan. You don’t need to be a lawyer to put this case together. Who does Trump toady to? Who does he always appease? Who does he refuse to criticize? Who does he refuse to admit attacked our country? Hint: It’s the same man who completely controls him, forcing him to destroy our democratic system of government. His friends call him Vlad. This entry was posted in Facts & Statistics, News & Views, Quotes and tagged 18 U.S. Code 2381, aid and comfort, allegiance, control, enemies, guilty, law, Public Law, Putin, Russia, treason, Trump, United States, war on August 20, 2018 by Ray Buchanan. We all know that the #BLOTUS cannot read or even begin to comprehend lengthy papers. We also know he likes photos and images in the material he is given. 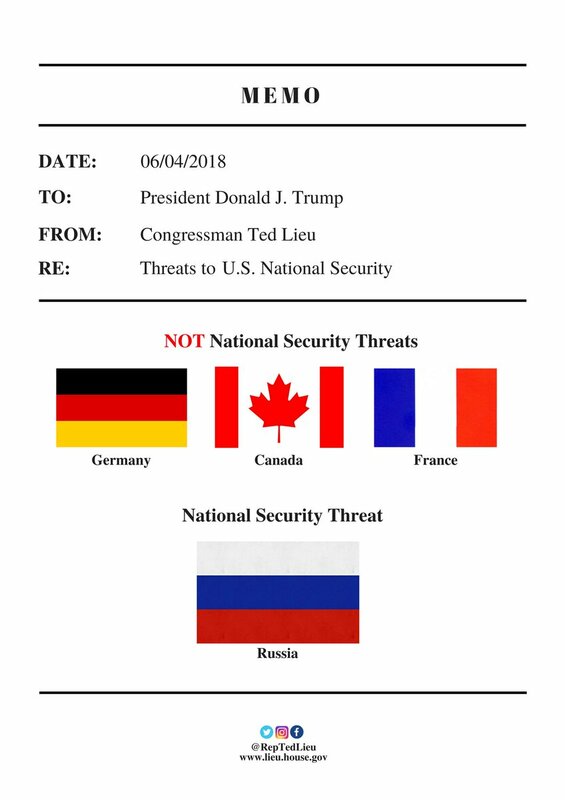 Congressman Ted Lieu has sent the President a memo even he with (his limited attention span) can understand. We are not threatened by our allies. We are threatened by our enemies. We do not need a trade war. We need a real President who is not trying to become a banana republic dictator. This entry was posted in News & Views, Quotes and tagged allies, attention span, banana republic, Canada, Congressman Ted Lieu, dictator, enemies, France, Germany, memo, national security, Russia, threats on June 5, 2018 by Ray Buchanan. 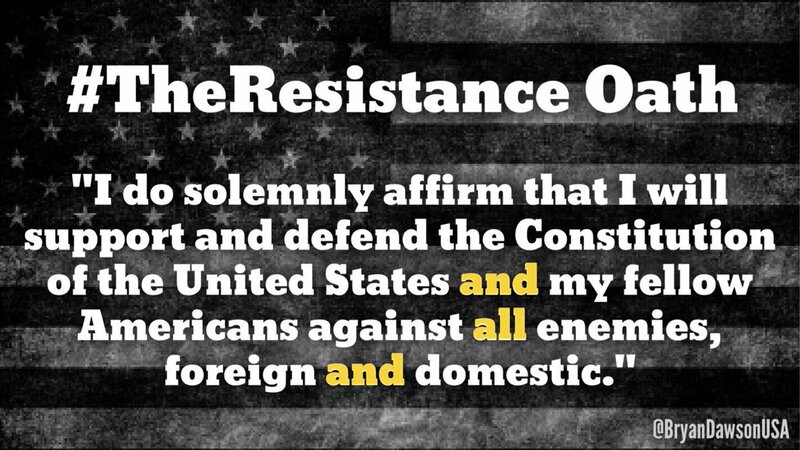 This entry was posted in News & Views, Quotes and tagged #theresistanceoath, affirmation, constitution, defense, domestic, enemies, foreign, oath, support, United States on November 6, 2017 by Ray Buchanan. If you have ever had the pleasure of spending time on a farm or ranch you know what a cow pasture looks and smells like. If you have ever walked through a cow pasture you have ample evidence that it is a home for cows. And, if you are like the majority of us, you avoid stepping in the ample piles of evidence. Look around, my friends. The evidence is piling up. Take a deep breath. That pungent aroma is the smell of fresh, still steaming Fascism. You recognize the evidence of cows in a cow pasture. Recognize the evidence of Fascism. Once you step in it, the smell cannot be removed. This entry was posted in Facts & Statistics, News & Views and tagged aroma, BLOTUS, corporate power, corruption, cow pasture, crime, cronyism, enemies, evidence, fascism, human rights, military, national security, nationalism, punishment, religion, sca[egoats, sexism, smell on February 9, 2017 by Ray Buchanan. I once had the opportunity to spend some time with the president of the West Sahara people. We met in the Sahara desert at a time when his nation was at war to regain the land they were driven from years earlier. One of the memories I have of that conversation which I’ve never forgotten was hearing that he would not accept the presidency until the laws were changed to allow the president to take part in combat (he had already been wounded several times before being elected), and that the law would also demand that every elected official must serve one month a year in direct operations. I cannot help thinking that such enlightened thinking might slow down our own elected officials’ casual attitude and easy acceptance of the real bottom line of war. This entry was posted in Facts & Statistics, Hunger & Poverty, News & Views, Quotes and tagged billionaires, blood, body bags, bottom line, business opportunities, combat operations, conflict, corporations, enemies, fiancally benefit, freedom, Major General Smedley Bulter, millionaires, politicians, profit, rich, tax returns, truth, war, World War I on January 11, 2016 by Ray Buchanan.